and generally to express the wishes of and safeguard the rights of the residents in these matters. 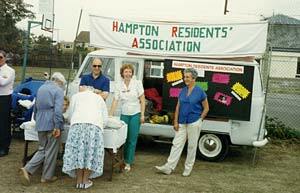 The Hampton Society, as Hampton Residents’ Association became in 1998, was the successor to five previous bodies, none of which endured for very many years. The first was formed on 27 March 1865 and lasted only 10 days. The fifth, and most long lasting, was founded in the 1920s and came to an end in the late 1930s at about the time of the bitterly opposed amalgamation of Hampton and Twickenham. It is of some interest that the 1865 group was formed under the chairmanship of Lord Charles Fitzroy, who was then living at ‘The Elms’, the house burnt down by Suffragettes in 1913. The foundations of this house can still be traced in the garden of 75 High Street. 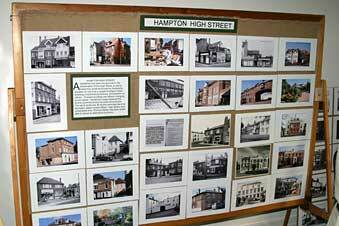 We are, with good reason, interested in our own history and in the history of Hampton, but we are much more concerned with the present and the future and in facing our current and potential problems we try to live up to the aims and principles so well set out by our predecessors in 1956. 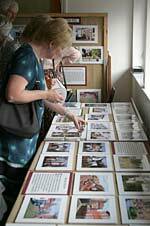 We provide an annual programme of 15 or 16 events – a mixture of talks, visits, social activities – but of prime importance is what goes on behind the scenes, a close scrutiny of planning applications, transport and road conditions, and environmental matters, and we vigorously oppose anything that is likely to damage the quality of life in Hampton. Over the years we have fought many campaigns on large and small issues. As might be expected, we have won some victories and suffered some losses. We had some hand in reducing aircraft flights over Hampton; in preventing the building of a massive hotel on Taggs Island; in improving the design and layout of the Nursery Land development; and in arguing (with limited success) for improved public transport services. 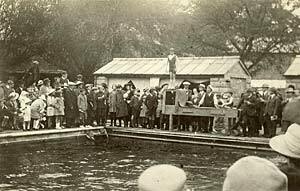 We gave active support to those brave visionaries who saved Hampton Pool from destruction and we were closely involved in the successful campaign for the creation of Hampton’s village green on disused filter beds. 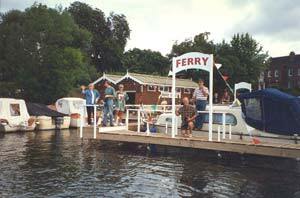 We have been glad to support our good friends in Hampton Riverside Trust in their work for Garrick’s Temple, for reopening the ferry, and the long overdue improvement of the riverside area at Bell Hill. We opposed the building of Terminal 5 and not too surprisingly lost. Together with the Council, other organisations and local residents, we opposed the sale of the St Clare’s Nursery and the building of the Sainsbury’s Supermarket for a whole range of environmental reasons and of course we lost. The irony of that particular failure, rarely commented on, was that the delays and legal battles, which dragged on over some years, resulted in a huge increase in the amount eventually paid to the Hampton Fuel Allotment Charity, and this has enabled them to continue to give valuable support to many deserving local bodies and individuals in need. On a day-to-day basis, we are particularly concerned to try to prevent inappropriate developments which all too often take the form of applications to demolish perfectly sound houses or bungalows and replace them with a number of expensive houses or even a block of flats. There are also audacious attempts at in-filling, squeezing extra houses in the spaces behind or between existing properties. We oppose all these, but with only limited success. Potential developers, with large profits in their sights, can be very determined and persistent, and the local authority – planning officers and councillors – do not always have the power or the will to resist in the way that we would like. Despite the problems, we co-operate where we can with the Council and seek - and often receive - the support of local councillors and our Member of Parliament. We are glad to work with other amenity organisations but we remain totally independent and are responsible only to our members. "All in all, the successes and compromises have outweighed the failures and it can fairly be claimed that the Association has had a beneficial effect on the moulding of Hampton in regard to housing, the landscape, and community services, in the past 25 years. At least, it would have been Hampton's loss if the Association had not existed." It is interesting and salutary to review the past, but we are now looking to the future and intend to carry on the good work in the years ahead. 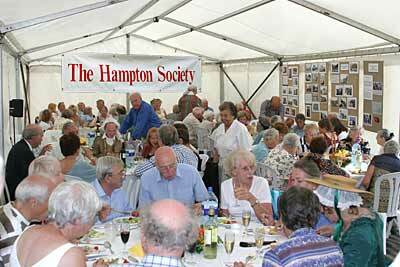 To celebrate the Golden Jubilee of The Hampton Society in 2006, three major projects were undertaken. The first was a map of Hampton specially designed to show places of historical interest and distributed to some 2,300 children in Hampton’s primary and preparatory schools. The second project was an exhibition of photographs, taken recently and back in the 1970s, which showed the changes that have taken place and emphasized the amount of restoration work still needing to be done. The third project is this Internet publication, produced in conjunction with the Hampton Riverside Trust, which we hope will be of interest to all Hampton residents and to new people coming to live in Hampton.